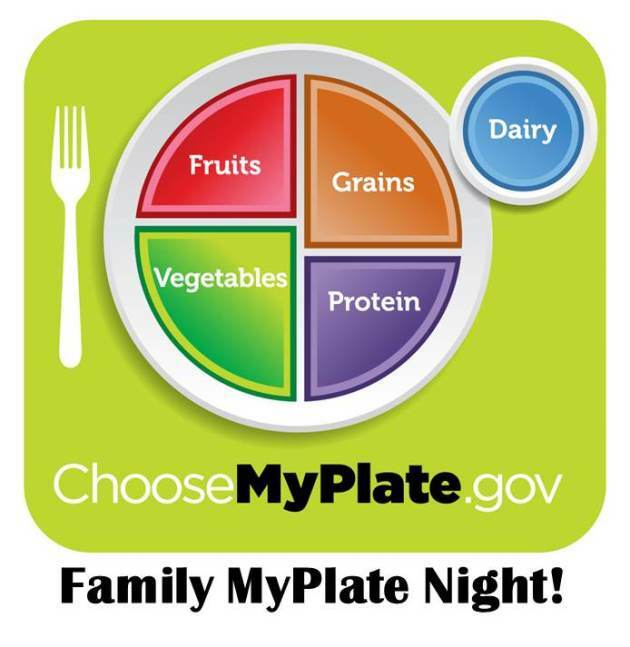 Family MyPlate Night: Where Kids Choose! Kids choose what items they can have for dinner. But they must use the MyPlate components on their plates. Simply print the MyPlate graphic slick and put it on your fridge as a guide, or even get MyPlate plates for the entire family for $10 each on Amazon. Now you have the visual for the family to follow. Now it’s time to select our items! Protein choices could be leftover meat, fish and/or poultry, but it can also be things like peanut butter, nuts, beans, soy or using a second dairy (cheese, Greek yogurt) as the protein. Grain choices could span the gamut from whole grain cereals, crackers to leftover rice and pasta. The recommendation is to aim for at least half of our grains to be whole, so it is not necessary for their choice to be whole grain. In our home, 99% typically is whole grain so most likely their choice will be as well. Veggies could include raw or cooked. Whatever is on-hand. If your child is limited in what s/he likes and picks the same begetable each time, let them do that. Praise them on including any veggie on their plate and it will encourage them to do it again. And maybe next time, they will be encouraged to try something new! Kids love positive reinforcement. Fruit can be served with the meal, or you could give them the idea to have fresh fruit as their dessert. My kids love mixed berries with whipped cream, or even fresh pineapple as a sweet ending to their meal. Have many different fruits for them to choose from. Keep in mind that this is an empowering activity for your kids, so try your best to not be critical. Remember that your goal here is not necessarily for them to pick the perfect items for that particular evening, but building confidence in your child to make healthy choices long-term. My 8 year old daughter, Hannah, told me something yesterday that made me smile. She told me that she put a brownie back in order to get a MyPlate at lunch yesterday. I wasn’t necessarily happy she put the brownie back, but that she thought it was more important to get her carrots. At her school, they can fill their tray slots with what they want and she couldn’t have the carrots and the brownie. She chose the carrots so that she would have all the items contained on the MyPlate. MyPlate night at our home helps our kids see foods that should be on their plate instead of what they should not, and that is what it’s all about! Feeding children is not something we do to them, it is something we do with them. Be sure that you are also participating in MyPlate night and show your enthusiasm when enjoying healthy foods. The MyPlate visual is a wonderful tool to use for your children and for your families to encourage balanced nutrition. Hannah and Evan love when we do this, and I really believe that it helps my kids see all their meals through the MyPlate standard. Try a MyPlate night at your home, and let us know how it goes! In case you didn’t catch the countless links we included in this post, learn more about the MyPlate and more on practical family feeding, health and wellness by going to http://www.choosemyplate.gov.